Last September I rescued (from the parking lot of a busy grocery store on a 4 lane hwy) a precious 2 month old little girl who had to have her right rear leg amputated at the hip. Her hip socket was completely gone and there was a 'suspicious mass' at the base of her leg, which thankfully was not cancer. In the last week she has been suffering from what I believe to be phantom pains... she had her surgery on 4/27. My question is... what can I do to help her through this? Comments for Phantom pains in amputee? I’m an MD trained in acupuncture and am fostering a cat that had a paralyzed leg and recent jaw surgery. An amputation was planned but the cat needed to stabilize and be able to eat first. I’ve had her a few weeks and at first she really seemed paralyzed and just dragged her rt leg around. In the past week she has been holding it up limping. Trying to use it some to move around the litter after a poo. And trying to use it to get a desired object. She feels like she has about half the muscle mass on the rt compared to the left. But it is clear that she did not loose all nerve function and part or all of this is brachial plexus palsy. This can improve over time and acupuncture can help The Vet at the pound was happy to give this more time. Phantom limb pain is not from pain at the stump. The pain sensation is coming from the brain. It has lost the sensory input from the limb and that can ramp up perception on sensation from that area to the point in humans at least there is burning pain, they can actually feel the limb is still there and it aches. Opiates don’t help but some seizure meds do. Acupuncture can also help possible by substituting with the needles a milder sensory input into the sensory area in the cortex that "monitored" the limb. I think the Canadians and Chinese are far ahead of Americans in using this modality to treat trauma and amputations. I’m so glad this little kitty for now gets to keep her leg. I can do some acupuncture for her and there is one Vet at TLC in Albuquerque that can treat her with laser and the pound Vet gave me the name of another in Santa Fe. That is where the SW school of acupuncture for humans is here in NM. The web site would only let me rate it a 5. Look into acupuncture acupressure and K-laser for a kitty in pain. Is my Pepper crazy or is this phantom pains?!?!?! OMG my baby kitten Pepper is three months old just had to have his hind leg removed. He has been acting weird. He rolls over on the floor and does weird scary flips and acts like he just figured out his leg was gone. He tries walking on it but he can't since it's gone, so he just falls to the ground like he's lost his balance. I hope he is just having phantom pains!!! OMG I can't stand to see him cry out when he does this. He has to be in so much pain. :( I don't know how to help him. :( My poor baby Pepper!!! Editor's note: I'm just seeing this comment now. Please call your vet and find out what is wrong. If he's experiencing disorientation, dizziness, seizures, and so on, then he needs to be checked out by the vet. I hope he's OK and I'm sorry to hear that he had to have his leg amputated. 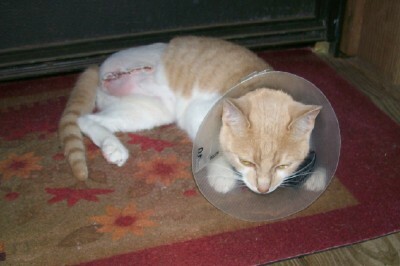 My kitty Mr Pink is 6 and recently had to have his hind leg removed. He is doing well after 5 weeks except for occasional strange occurrences - he will roll over on his back, writhe around helplessly and look in panic. This lasts 10 or 15 seconds, then goes away. Is this phantom pain? Will it go away? Should I be worried? I don't know what to do. Editor's note: I'm sorry to hear about your cat's condition. I would consult with the vet to make sure that this isn't something that needs treatment. Your vet would be the best person to determine if this is phantom limb pain, or something else, such as seizures. I hope it isn't something severe, and he recovers quickly from all of this. Wow, I thought my cat was having seizures after her left rear leg amputation just before Thanksgiving. She had shattered the bone in so many places it could not be pinned. She uses her claws now to climb up on things instead of trying to jump. Every once in a while she starts writhing about and screaming like she may have her claws hooked on something, but when I check her feet are free. I just pick her up and place her someplace else and she seems okay after a while. I am wondering if this is phantom pain. She is still healing up and there is a tip about the size of a piece of rice that is in the process of closing up. She has been on newspaper litter to prevent infection until she closes up. Residual Limb Pain: derived from injuries to nerves at the site of the amputation. My cat had a leg removed 15 days ago. On day 10 he started experiencing severe random pain and his lower body became contorted and twisted as though something was pulling on him. He cried out and pupils became dilated. The first thing vet says is most likely phantom pain. Meds are little to no help. I recently read of residual limb pain from article discussing amputations in humans. R.L.P is not phantom limb pain. My cat is suffering worse now with these "attacks" than the pain before surgery. Thank you for continuing to share with us here in our "cat community." My experience with forums is there are usually about three people "lurking" to every post, but they are afraid to speak up. You'd have to ask Kurt about that - this is his site. But I'm sure more people are following it than we can see. I'm pleased at her progress, and I'm sure it will continue. Pets and people that suffer a handicap at a young age seem to adapt so much better than those that are older. So, keep us posted and you will be in our thoughts. Using the bathroom after amputation. Since you recently went through this maybe you can help me answer the question. How long did it take for your cat to use the litter box after amputation? You're welcome, Barbara. I only wish I could do more for you and Summer, but I'm glad to hear that she's recovering well. Thank you for sharing Summer's story with us. Please keep us updated on her progress and like David says, keep her purring! Thank you both so much for your insights and comments. :) Summer is well on her way back to being her usual sweet, mischevious self. She is still in the process of building the strength in remaining rear leg and can go to most of the places she could before. There are some areas that we have made ramps to help ease her passage. :) She is such a remarkably sweet young lady who's favorite room is the bathroom.The lap is also another favorite spot. We have 5 other 'rescue kitties' and Summer is the only one who will let us hold her for any length of time. What is sweet is to see how tightly she has 'Dad' wrapped around her little paw :)... he is enjoying spoiling her greatly. Actually, this time Kurt has so much more than I can offer you except my thanks for taking on this lovely kitten. I hope you continue to share the progress with us. When our first kitten, Jean-Luc, was spayed we asked about pain medicine for her. They told us "Cats handle pain very well." We beg to differ! Though it didn't kill her, we knew she suffered for a couple days. That is one of the reasons we are willing to pay a little more when we have ferals (and our own "housecats") neutered, to ensure they have proper pain control. Cats are truly amazing, and I'm sure you and your kitten will do well in the long run. Kurt provided you with some good information I hope you can find useful. Until then, try the "holistic" approach and just cuddle with each other (get that "purr factory" running) - it will be good for both of you! Again, thank you so much for saving this little life! I know you will be rewarded! I'm sorry to hear that your cat has had to go through this, Barbara. Thank you for rescuing her from the streets! Over the years, my cats have been through a number of medical and surgical procedures. I've always just tried to give them the most comfort that I can, give them their space when they seem to need it, and distract them as much as possible with light play and treats when they're up to it. Although I've cared for post-surgical cats, I have no direct experience with a cat with a leg amputation. I've long suspected that some cats who have been declawed experience phantom limb pain, but I have no data on this. There are drugs that may help, such as analgesic pain medications, but all drugs have side effects. PetMD mentions the use of gabapentin, an anti-seizure drug with analgesic properties which may help with this condition. Cats and pain killers very often do not mix. Cats can have bad reactions to non-steroidal anti-inflammatory drugs (NSAIDs). The phrase you'll often hear is "cats do not tolerate NSAIDs well" but after hearing too many stories about kidney failure and death from metacam given to cats orally, the word "tolerate" bothers me. There are a number of recommended techniques for treatment of phantom limb pain in humans, and some of these may apply to cats. Dogs and cats are said to have similar mechanisms to humans for experiencing pain, so it stands to reason that some of the same treatments may work (although giving human medications is a definite no, unless prescribed by a veterinarian. A single dose of Tylenol can be deadly to a cat). WebMD, in their pain management guide include heat, massage, and physical therapy. I would recommend that you check with your vet to see if any of these are not OK to do at this stage of recovery, and try the ones that are. If your cat responds to catnip, I would ask your veterinarian if that's something to use as well. Some cats react quite strongly, and she may not be physically ready for it. But, there's said to be a certain euphoria that goes along with the experience, so it might be something to consider. I'm also thinking that an animal or feline pain management specialist might be able to help. There are many veterinarians who use holistic or integrative techniques, including acupressure and acupuncture. I know that these techniques are subject to some debate as to effectiveness, whether the patient is human or animal, but they may be worth looking into. The good news is that I've heard many stories of three legged cats that have lived long and happy lives. When I was growing up, one of our neighbors had a cat with three legs and seemed to get along pretty well.